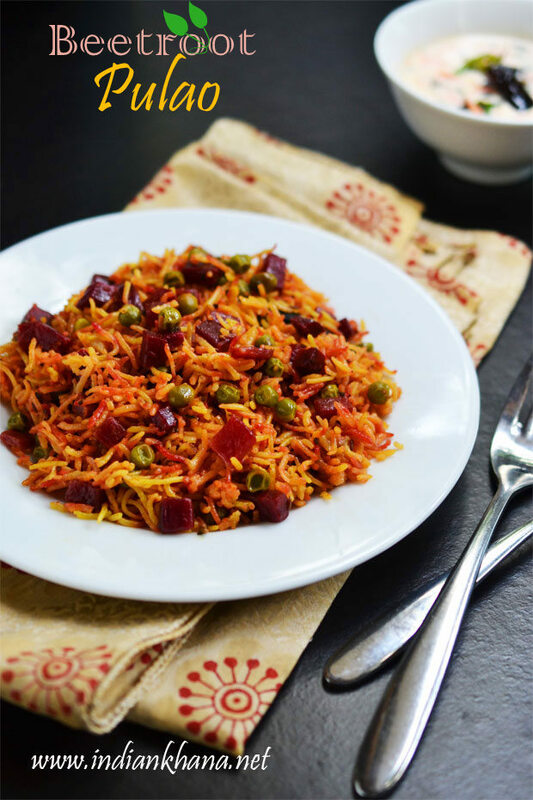 I love beetroot and that's not a secret here as I have posted ample of beetroot recipes and I always have beetroot stock with me, yes always :) and I make this pulao whenever I want to finish cooked fast without much hassle. 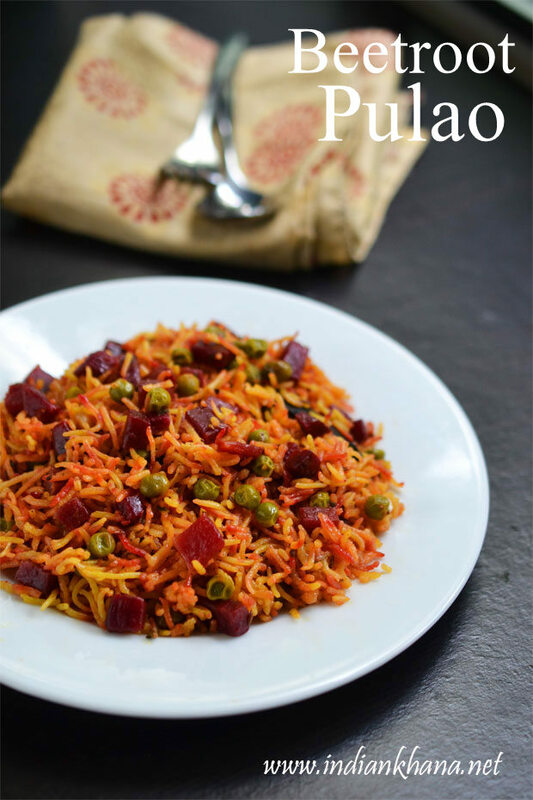 I have taken this pulao pictures so many times and recently during the capsicum raita but since I lost the pictures I couldn't post this recipe before. I made this again a week back for weekend lunch and clicked pictures again hoping this time it will make it to blog :) and finally it's happening. 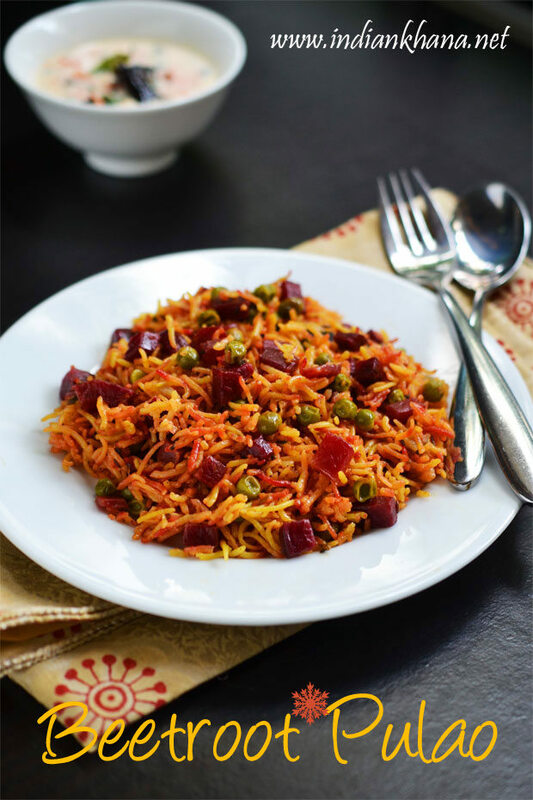 I have used capsicum instead of peas and it taste yum too so you can try that, or you can also add other vegetables like potato, cauliflower, beans etc to make it more nutritious and wholesome specially for kids. I pair this raita along variety of raita like capsicum raita, onion-tomato raita, cucumber raita and this time I paired along carrot raita, which recipe I will post soon. 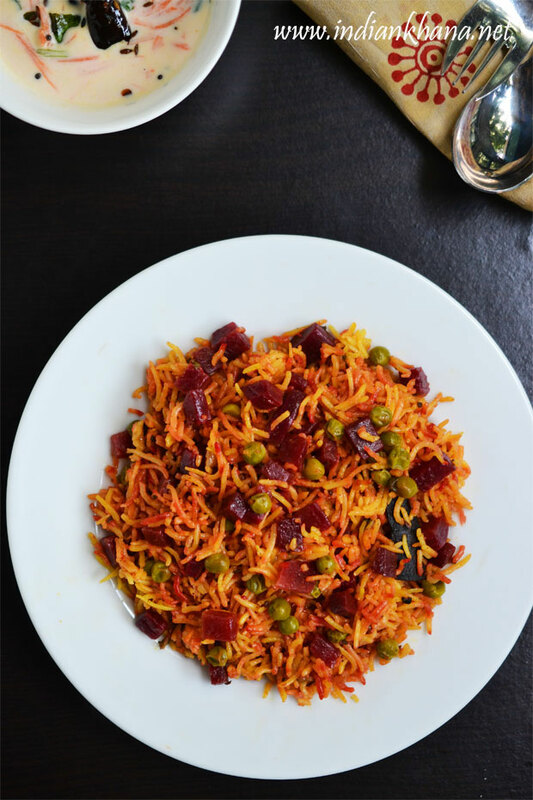 Meanwhile enjoy this delicious pulao. Soak rice for 30 mins or until needed, rinse 3-4 times in fresh water and keep aside. Meanwhile peel and chop beetroot in small pieces, peel and slice onion, chop green chili, coriander leaves and keep peas outside if using frozen. Add beetroot and saute for 2-3 mins in medium flame. Add red chili powder, turmeric powder, coriander powder, garam masala and mix well, cook for another minute. Add peas and saute for 2 mins. Add rice mix gently and saute for 2-3 minutes in medium flame, stir in intervals. Add water, salt, coriander leaves and mix. Close cooker and cook for 2 whistles. Once pressure released gently fork rice. Serve hot or warm with any raita of choice. I also add capsicum with peas or just add capsicum it bring nice flavors, you can try that. If you don't eat too much of garam masala, you can skip the whole garam masala and just use bay leaf, cumin seeds. 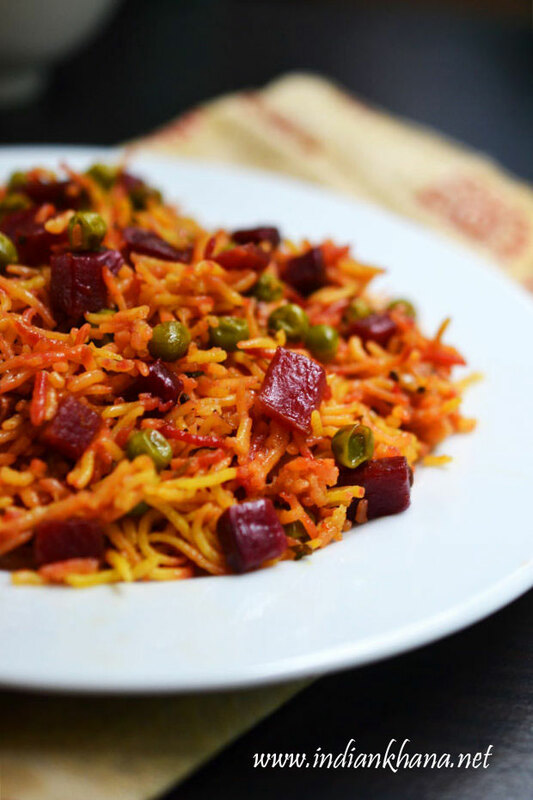 Delicious, one pot meal beetroot pulao.